One of my favorite images from the morning. 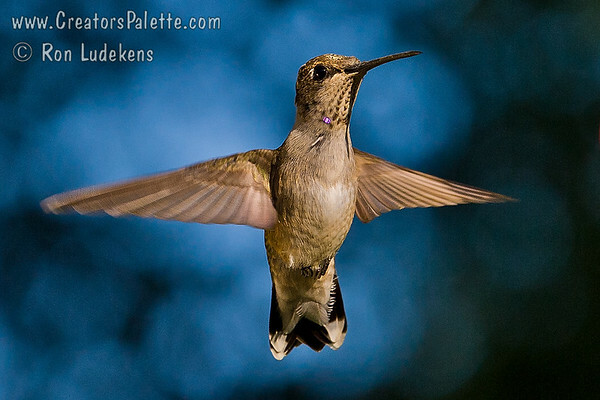 I wasn’t sure what to title this post: “Poetry in Motion”, “Frenetic Energy”, “Studies of Flight” or “The Most Photographed Bird Feeder in America” – explained below. Saturday morning 15 photographer friends gathered at a private home (thanks Sue M.!) outside Visalia at 6:30 in the morning to capture images of the hummingbird migration. 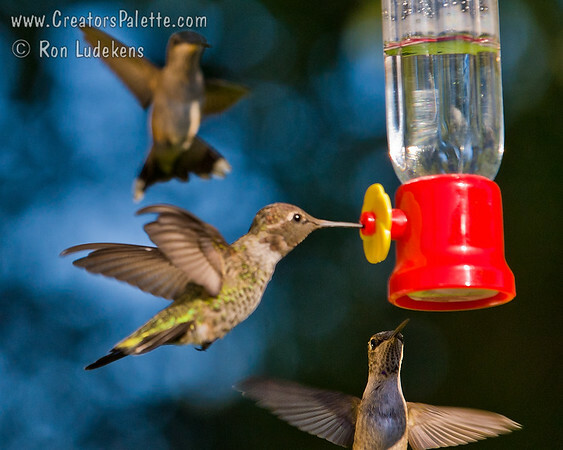 There were hundreds of birds gorging themselves on multiple bird feeders as well as the natural nectar from a flower filled yard. This was really a special treat for those of us who have tried in the past to capture an image of a single one of those flighty characters flitting from one flower to the next. 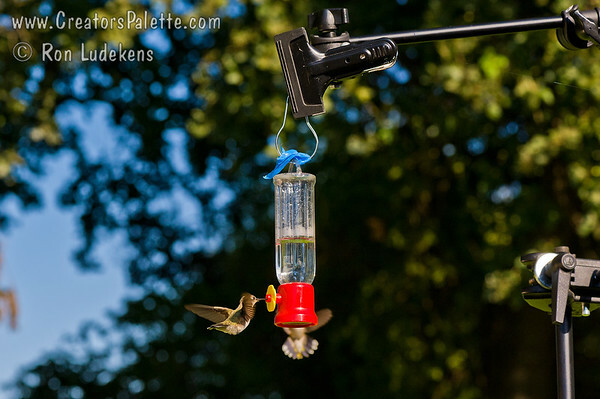 Here we only had to set the camera on a tripod, point it at one of the many stations on the multiple bird feeders and watch the lens fill with hungry critters. Only I did not find photographing them all that easy – it was a challenge. Getting them in focus is the problem. Auto Focus Off: It did not take long to realize that they don’t hold still long enough for the auto focus of the camera to work very well. Even the Nikon D700 with its incredible speed was failing far too often to the point of frustration. The easy solution was to go to manual focus and focus on a spot where the birds will be. Easier said than done. 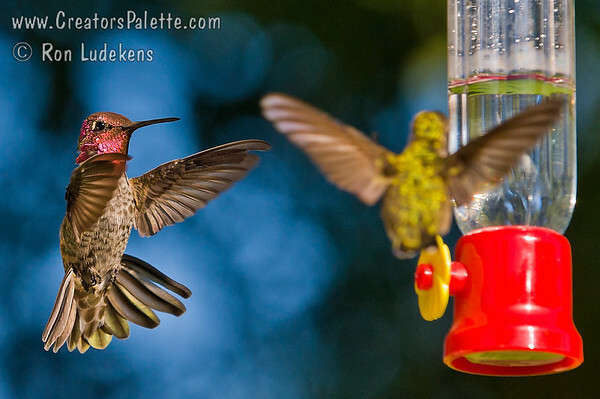 It was easy to focus on the bird feeder but that was not making compelling images in my opinion. I wanted something different – like to capture the images of them negotiating the flight into the feeding station and the frequent conflicts between competing males. Fighting for position and right to eat. Depth of Field: In an effort to get the highest shutter speed, one also needs to open the aperture to let in more light. When you do that, the depth of your focus spot becomes much shallower. It is even worse on a telephoto lens which is what we all wanted to use to fill the frame with the tiny birds. So to shoot at f2.8 meant I rarely had a bird in focus, and if it it happened to be in the sweet spot, it would only be a slice of the bird anyway. Even at f5.6 I was not getting a whole bird in focus. I ended up shooting a lot at f9 and f10 and boosting the flash and ISO to keep from being too dark. Freeze the Action? 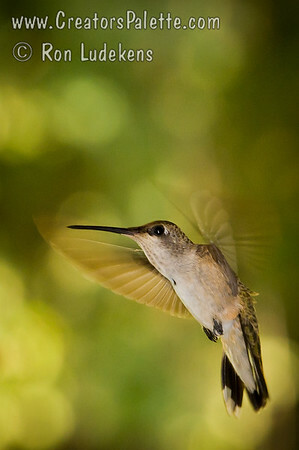 : Humming Birds burn an incredible amount of calories just to make it hard for photographers to freeze their movements. To do that you need to shoot at a very high shutter speed (and that won’t completely freeze the wings) or use a strobe where the nearly instantaneous duration of the flash stops all movement. At 6:30 in the morning on the west side of the home the light was not even bright enough to hand hold the camera let alone freeze wings in action. Even cranking up the ISO into the noisy range was not good enough (not even close). I tried to use an off camera flash to freeze the action but could not get the high speed sync to work as I have in the past. So those shots ended up with a shutter speed of only 320 for the ambient and the flash freezing part of the motion with a lot of ambient light wing blur around it. If you like the feeling of motion in the image, I have lots of those. Image shot at 1/320 with flash. Lots of motion. Our resident expert in bird photography, Tim Scott, was probably smirking as he watched our attempts. While the rest of us were experiencing our challenges, he went calmly about setting up a bird feeder on a light stand in the middle of the yard, then sat down on a comfortable chair to watch. Later, I realized his wisdom and experience. As the sun rose higher, it eventually lit the yard and his lone bird feeder. Now, he grabs his camera rig and starts shooting with much better light and faster shutter speeds. Then a bounce reflector to bounce more light on the sweet spot. Before the morning was over, I believe we all sat around that one bird feeder with only one station to feed from and got our best shots of the day. This is why I considered the title of “The Most Photographed Bird Feeder in America” as 15 photographers cranked off 400 or more rapid fire shots with the feeder in the image. Thanks Tim! 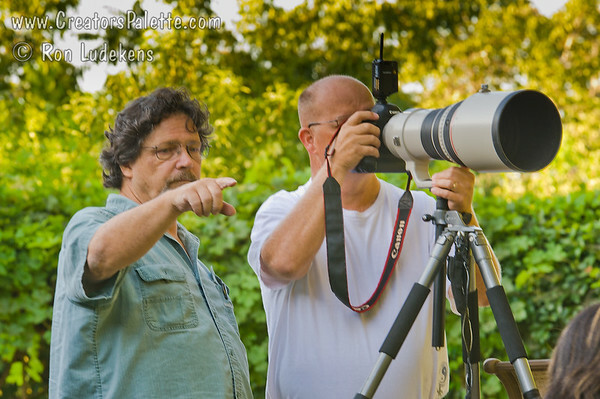 Drooling over Lenses: Bird photographers either need to be rich or not married. 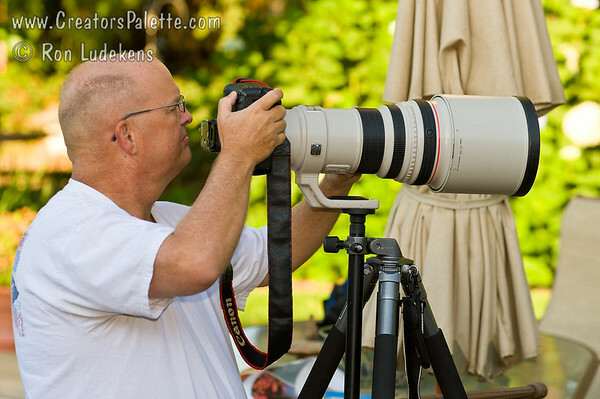 I was shooting with a very expensive (in my opinion) professional 70-200 f2.8 Nikkor lens. On my full frame F700 camera, that is not getting me close enough. To fill the frame (after the shot) I needed to crop the resulting image making the ability to print a large print inappropriate. In my gallery, you will see that enlarging the image from the display image to the Original image does not make it much larger. If I had my D7000 (in the shop for repair), I would have gotten 50% closer using the same lens and probably been happier with the results (if the high ISO noise levels were similar). Of course, I’m not so sure I would carry it very far on a hike in the woods. Note to wife: if you want to buy a birthday present here it is. Of course it costs more than my first and second car or a third of my first home. A special thank you to Sue for opening her home to a herd of fun loving photographers and Irene for setting up this possibility. Also thanks to Tim for sharing some of his wisdom and experience. We had a great time and even got a few decent images to enjoy. God created a marvelous world full of wonderful sights and people. 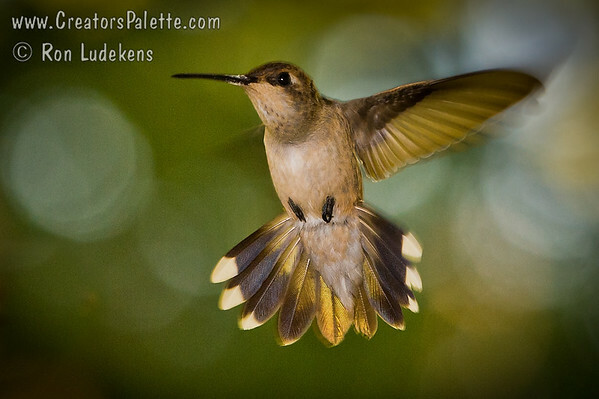 He is the Creator and it is His Palette of beauty that Ron Ludekens tries to capture as photographic images. Images of nature or images of people and their lives - both reflect the handiwork of the Creator. 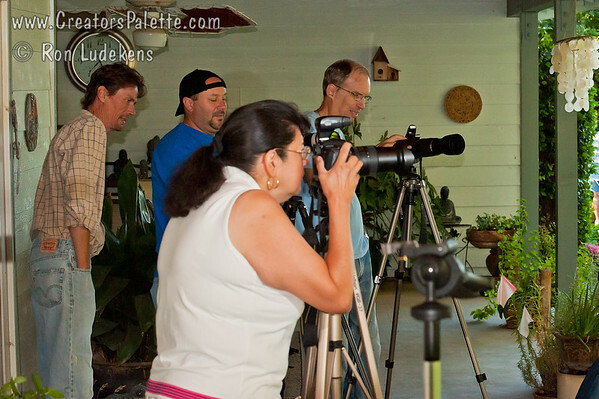 Ron is a photographer living in Visalia, California - part of the great Central Valley. He is immediately surrounded by agriculture and all the hard working people that feed our world. A short distance away are the grand Sierra Nevada mountains, impressive National Parks and, wider still, the vast diversity that California has to offer. Ron is one of the family owners of the L.E. Cooke Co Wholesale Nursery - a leader in the horticulture industry of North America. Even on the job, his camera is always near by. His photos for the nursery trade have been published in print and around the websites of nurseries across America. Ron is also a leader in his church and its missions. Ron's photography has been a resource the church uses in its communications and message. Plus photos of all the fun things we do are shared among members and friends. Ron also loves capturing precious moments in lives of people. Weddings, senior portraits, graduations, family gatherings, maternity and special events. Ron will not shoot more than four weddings a year to provide the attention to detail and followup that is required for such an important milestone event in the lives of the couple. Ron can be reached at 559-732-7165 or cell 559-967-5370. This entry was posted in Birds, Photography - General Topics, Wildlife. Bookmark the permalink.